The 2018 Tax Free Holiday has passed. Please check back in the summer for 2019's information. During the annual Sales Tax Holiday, a variety of back-to-school essentials are exempt from the state's 6% Sales Tax and any applicable local taxes. Tax free items range from clothing, accessories, and shoes to school supplies, backpacks, and computers. Shoppers will also find tax free items for the home and dorm room. In past years, South Carolina shoppers have saved between $2 million and $3 million during the holiday weekend. Items such as jewelry, cosmetics, eyewear, furniture, and layaway purchases are not exempt. These abbreviated lists include common items. Please see RR10-7 for a detailed, comprehensive list of exempt and nonexempt items. When is the Tax Free Holiday? 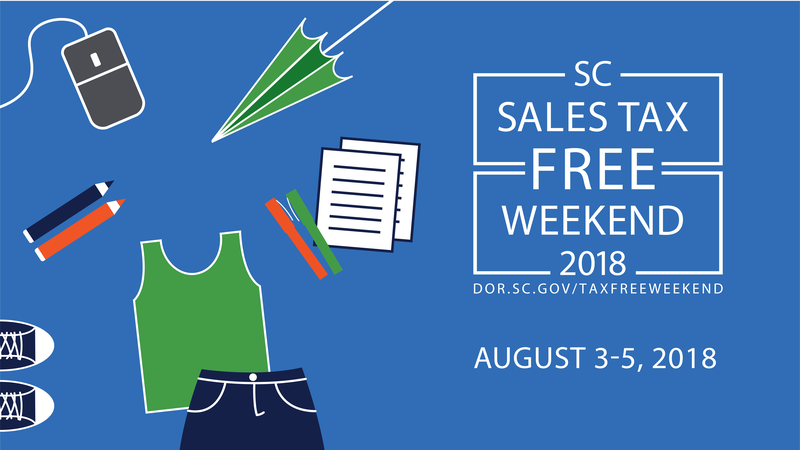 The Sales and Use Tax Holiday (Tax Free Weekend) takes place annually beginning 12:01 a.m. on the first Friday in August and ending at twelve midnight the following Sunday. 2018’s holiday begins Friday, August 3 and ends Sunday, August 5. What is exempt from the Sales and Use Tax during the holiday? Broadly, exempt items include: clothing; clothing accessories including, but not limited to, hats, scarves, hosiery and handbags; footwear; school supplies including, but not limited to pens, pencils, paper, binders, notebooks, books, bookbags, lunchboxes and calculators; computers, printers and printer supplies and computer software; bedding, pillows, and bath towels. General lists of exempt and non-exempt items are separated by category, above, or a comprehensive list is available from the SCDOR Policy Section. What is not exempt from the Sales and Use Tax during the holiday? The exemption does not apply to: sales of jewelry, cosmetics, eyewear, wallets and watches; sales of furniture; a sale of an item placed on lay-away or similar deferred payment and delivery plan; rental of clothing or footwear; a sale or lease of an item for use in a trade or business. General lists of exempt and non-exempt items are separated by category, above, or a comprehensive list is available from the SCDOR Policy Section. If I buy an eligible item during Tax Free Weekend, does it have to be delivered during the holiday in order for the exemption to apply? Not necessarily. As long as the item is ordered and paid for, and the order is accepted by the retailer during the weekend for immediate shipment, the exemption still applies, even if delivery is made after the holiday ends. If I buy an eligible item online, is it still exempt? Yes, provided the item is eligible for exemption and the sale occurs during the holiday. Are delivery charges to an eligible item subject to tax? No; if an item qualifies for exemption, the delivery charges associated with that item are also exempt. How are returns and exchanges handled during the holiday? If you purchase an item during the holiday and exchange it for the same item after August 5, no additional tax will be charged. However, if you return it and receive credit for a new purchase, the newly purchased item will be subject to the Sales and Use Tax. If you purchase an item before August 3 and return or exchange it during the holiday, no additional tax will be due if the exchanged or purchased item is also eligible. How will the holiday apply to rain checks and layaway items? An eligible item must be purchased during the holiday to be exempt. A rain check issued during the holiday does not qualify an item for exemption if it is purchased after August 5. If a rain check was issued on an eligible item prior to the holiday and the item is purchased during the holiday, it will be exempt. Items placed on layaway are not exempt. Any retailer who sells eligible items will participate in the Tax Free Holiday and may not collect sales tax from their customers on eligible purchases. I am a retailer. How do I report sales during the Sales Tax Holiday? Filing by Paper: Report your total sales exempt during the Sales Tax Holiday on page 2, Item 4a of Form ST-3. I know computers are eligible, but what about smartphones, tablets and other technology? Cell phones, smartphones or other handheld devices that make telephone calls are not eligible. Neither are handheld devices that are primarily used to download and listen to music; handheld devices that are primarily used to download and watch videos; or devices that are primarily used to download and read books. However, portable devices that have computing and media functions, allow users to access the internet, and have a multitude of software applications are considered computers and are eligible, provided that they are not capable of making telephone calls. What kinds of computer accessories are eligible? Only computer parts purchased along with a CPU are eligible for the exemption. A monitor, keyboard or scanner by itself is not eligible, but if any of these are purchased in a package with the computer itself, the entire package is exempt. Digital music players, digital cameras and cell phones or smartphones are not exempt regardless of whether they are purchased with a CPU. What counts as a school supply? School supplies are items used in the classroom or at home with respect to school assignments. School supplies include, but are not limited to, pens, pencils, paper, binders, notebooks, books, bookbags, lunchboxes, and calculators. Items such as refrigerators and toiletries purchased by college students are not school supplies and are not exempt. Similarly, these items purchased for office, business or non-school use are not exempt. Are musical instruments exempt? What about books? Yes, books and musical instruments are exempt, provided that they are used for school assignments. Text books are already exempt from the Sales Tax, but additional books used for school like dictionaries and those used for book reports and reading assignments are exempt during the Sales Tax Holiday.